- Char Taylor: 18, 5' 7", 115 lb, 151 cm snowboard, 4 years riding. i haven't been riding for a really long time, but i love this board, it has enough flex so that it's easy to ride anywhere, it's not as good for terrain parks or stuff like that, but excellent on the mountain. - Shannon McNall: 32, 5' 4", 130 lb, 147 cm snowboard, 1 years riding. I bought this board as a novice. I had tried snowboarding before, but on a board that was much too heavy and long. The feather is truly what it's name says. It allows you to float on the mountain. Turns become much easier to learn, because of this board. On the downside, I know that this board will not last me more than another season. It seems the more advanced I become and the steeper terrian that I choose to go on the more the board is starting to hinder, instead of help me. It think if you are willing to pay the price it is a great board to learn on, but plan on purchasing another board within a year or two. - Brittany Heikke: 21, 5' 5", 120 lb, 147 cm snowboard, 8 years riding. I got this board Christmas of 2004 and immediately put it to good use, beginning at an intermediate/advanced riding level. The board itself is probably better suited for less-experienced riders, more novice, with a balanced flex that offers just enough stability for all-terrain riding. Lightweight and maneuverable, but this sometimes means that it won't hold its own on hard landings. I would only recommend this board for those that aren't going to be stomping the big stuff but still want something flexible for the park, pow or groomed bowls. The board did start to fall apart the winter of '07, chipping away at the edges. I eventually lost a good five inches off the tail-end, and after hearing that this is a common problem with the Burtons, will not be purchasing another. While not durable, it's a great transitional board and works well in all environments. - Christina: 21, 5' 0", 120 lb, 145 cm snowboard, 2 years riding. This was my first snowboard that I have ever bought. It was a good beginer board to start with. It carves nice. The major draw back that I did not like about this board is that once I became better at snowboarding it was a little slower then the pace I wanted to go. For the size being so small it is a little hevier then a lot of bigger boards. For the most part though i have enjoyed my board and, if you are just starting out and don't like to fast then this is the board you want then. When I first started snowboarding, I bought a cheap Lamar board. 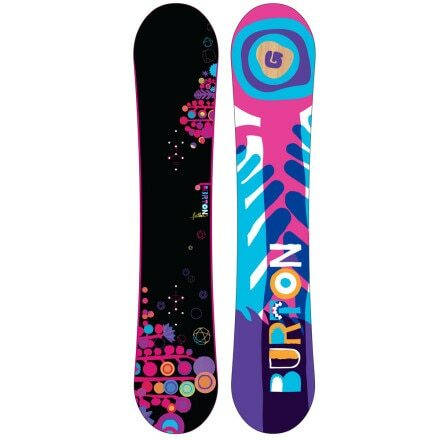 After the first season I bought a Burton Feather. I cannot tell you how much the Feather improved my riding. It is obvious to me now that good equipment does make a difference. This board may seem a bit expensive, expecially if you're just starting out, but it's worth it. If you want a quality experience, get quality gear. 4 all girlz who love flex and durability in a board, this 1 is 4 u. It let's u stomp landings softly of of the smallest jumps to the 20 footers. Rails and boxes r a breeze because the board follows yur leg movement, and the flex makes landings easier. I'd recommend it 2 any gal who loves a flexible all mountain ride. I recently picked up the 2005 Burton Feather as my first board purchase and I love it! This board is lightweight and has a soft flex - perfect for the beginner who's learning to turn and who wants to build confidence. Not so great on powder as on groomed though. Sweet ride for the money. Good choice for a first board. While this is a great board to learn on, after taking it out for a couple of weeks in Japan I very quickly developed a love/hate relationship. Although it had previously served me well on the nice baby groomed runs, taking it down the steeper terrain resulted in control difficulties. Secondly, the budget build makes it a more fragile ride, with mine starting to develop serious damage after only a couple of days (the top sheet laminate began to peel back). It also has a more budget base that doesn't hold wax as easily, and thus requires waxing more often. Although this was a great board as a beginner, it really won't last serious riders for more than a season. In many ways you're better off seeing yourself through the baby years on a hire board. I demo'd this board several times when I was trying to decide what to buy. This is a great learning board because it's super light and very easy to maneauver. I ultimately went with a Feelgood because there's to much give in the Feather once you start going fast. If you're just doing beginner falling leaf stuff, this is the perfect board to do it on. Easy board to ride - highly recommended for learners. Easy to turn, no fear of catching an edge. Be careful in the hard pack though - a little hard to control there due to the board not being edgy. My girlfiend used this as her first board and was able to learn easily. It was a soft board making it very forgiveable, I wouldn't have wanted her to learn on any other board with any other aspects. i have mine from 2 years ago that i got at our ski/snowboard show, and its a love hate relationship. like what the past people said, this board is VERY had to control when you speed up to a relatively fast speed, its SO unbelievably hard to control. this board is my baby and i learned on it :) but now that ive done the basics and got over my fear of going fast and through trees, it makes it near impossible to do it without catching an edge or riding a frikkin bull. not much to say about the board other then its a good board for beginners. Its a relatively decent price and rides well. This board I hear is great for beginners! Great board for the bunny slopes, buck's like like a b! @tch once you get any kind of speed going though! This board's so light and easy to flex, great for learning on. Is fun to ride on at low speeds on or off trail and has a bit of pop to get you started over kickers. It'll get you to the top of the mountain in no time, at which point you'll be looking for your next board. I have an '09 Feather, but I love it! It's great for just starting yet flexible for freestyle. I rode switch because I wasn't sure if I was regular or goofy at first, so this board was great for either! The graphics on mine are a little boring for me (granted I am an art major) but they definitly get better each year.